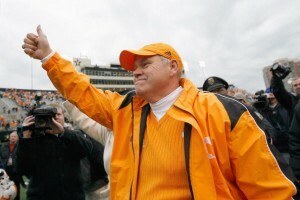 University of Tennessee Phillip Fulmer has been announced as the keynote speaker for charity event “A Night of Champions” that is happening at 6:00p.m. on January 22 in the Victory Baptist Church in Mt. Juliet. Tickets to get in will cost $25 per person and all funds that are collected will be used to provide scholarships for underprivileged kids to be able to attend the 4th Annual NFL Youth Football Camp that is put on by the MWAPevents organization. The same organization is putting on the function and is expected to bring it a good turn out with Fulmer’s presence. Fulmer will be speaking at next year’s MWAPevents’ Annual “A Night of Champions” event that is happening on January 22 at the Victory Baptist Church in Mt. Juliet.